Technology has blessed us with so many devices which we can connect to Wi-Fi. If we talk about accessing of internet at our homes, the very first thing comes in our mind is set up of Wi-Fi router. Till the time Network is not wireless, it won’t allow us to connect your devices anywhere in the home. We can do it with wires too but we all know that connectivity of internet with wires is very difficult to handle these days. Everyone want wireless these days. Here i am explaining the ways to setup your network wirelessly. These days router are available in different sizes and shapes. Look at the features of routers according to your choice and need. If you want network of internet in should cover approx every area of house or lot many walls are there in your house, you should go for router who has the option of antenna up gradation. at the same time if many Wi-Fi devices will connect at various speeds then would recommend Multi-In Multi-Out type of router, Else at the same time all devices will not get the good speed. These days all latest routers are coming who support Wireless-N or 802.11n. They are offering the highest speed, stable and adaptable with Wireless G routers. With the help of wireless routers Routers you can connect broadband connection with various devices. For that, you required to connect modem of broeadband with router. Keep router and modem near to each other. With Ethernet cable connect both router and modem. In router packaging you will get an Ethernet cable which can be use to connect. 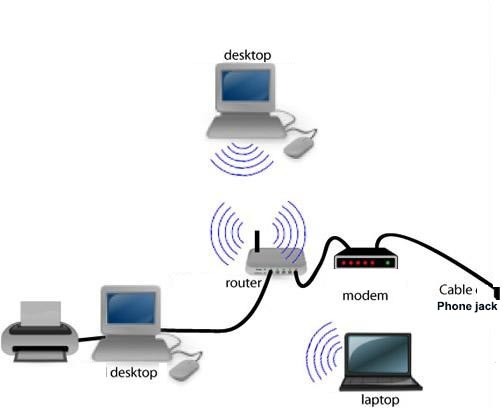 You need to Connect modem with internet or wide area network port of router.It is usually offset, From the Local Area Network ports, it could be available in different colors and normally in offset mode. If have are using video game console or closed computers or TV. With Ethernet cable can connect them with router. It will give faster speed, stability and any extra configuration does not required. In order to adjust settings of router you need minimum one computer who will connect by Ethernet cable. later on if want to access internet wirelessly you can disconnect the same computer. If you are installing new router for the first time, you can get the IP Address will be printed on the label of the router or you will get it on the documents which you will get with the router. Still any how you are not able to get the IP address of your router anywhere then you can check it on the respected website of your router by putting up model number of your router. Most common and by default IP addresses of router starts from 198.162.0.1, 198.162.1.1, or 198.162.2.1. Open browser connected with router. On the address bar of the browser enter router’s IP address and hit enter. With this your browser will come to the configuration menu of router. If you have installation disc which comes with router, instead of entering IP address on the address bar of browser directly start the configuration process. It will automatically complete many manual steps. If you want to reach the configuration page, You need to see the IP address of the router and required to put the correct username and password when asked. these days every router is coming with Most routers have a primary set up of account which required to log on. depends upon models of router but it should be available either in the documents of router or will be printed on particular router. Most common username are “admin”and passwords are “admin and password“. Some of routers only username will be required and password will be blank, while in some of routers you do not need to enter anything just leave them blank. If you are not able to get the the right information about the IP address, username and password, then you need to go online in order to search for the by default login details by entering the model number of router. If Online the login details has been already changed then you need to push the reset button from the backside of the router from 10 seconds to 30-40 seconds to If it has been changed, press the Reset button on the back of the router for 10 (to 30+ seconds as dictated in the instructions for the router model) to recover the default login details. When you will be able to login to router, then you will automatically go to screen or main page of router. you will get number of options from there you need to choose. Due to default settings you will get the internet option at the left due to default settings, Till the time you do not have the proper guidance from the internet service provider, you won’t be able to access the wireless network. you will get a field of SSID or name at the wireless section. yuo need to put unique name of the wireless network. other devices can see this name when they will scan for the wireless network. you need to enable the internet broadcast. Actually it will get started the wireless network. Select security method for router. you need to select from the available security option list. If you want the best security for your router then need to go for WPA2-PSK which is coding method. due to coding this type of security cannot be hacked or accessed, that’s how you will be protected from the intruders and from the internet hackers. After selection of safety method, now you need to put the password for network. Password should be tough and should be a combination of symbols, letters and numbers, Please do not use such type of passwords which can be very easily accessed from your network. Once you complete the task of security of your Wi-Fi network, now hit enter on Save button or Apply. The same changes will be implement to your router,which could take few moments to apply. now your router will reset and you will be able to access Wi-Fi Network. You need to modify the username and the password which you are using to connect to router after the network configuration,With the you can secure your router from any kind of unofficial changes or modifications. For that you need to go to the administration section and from the configuration option of router you can change it. If by accessing some websites,you wish to stop all other devices who are connected to you through your network.you can restrict them by using blocking tools options from the security section of router. You can block them by keywords or their domain names. If you have any question do not forget to ask me via comments. Do not forget to like us on Facebook and follow us on twitter.